A few weeks ago, I wrote Exploring the Public Education Paradox – Evaluation and Public Education (response to Jamie Clearfield). Soon after bemoaning the apparent lack of understanding of evaluation and its role in public education, I was delighted to find a chapter devoted to program evaluation in an education book I’m reading with my colleagues. I was even more excited to discover a section on theory of change and logic model. Seldom (if ever) have I seen these concepts addressed outside of an evaluation text. 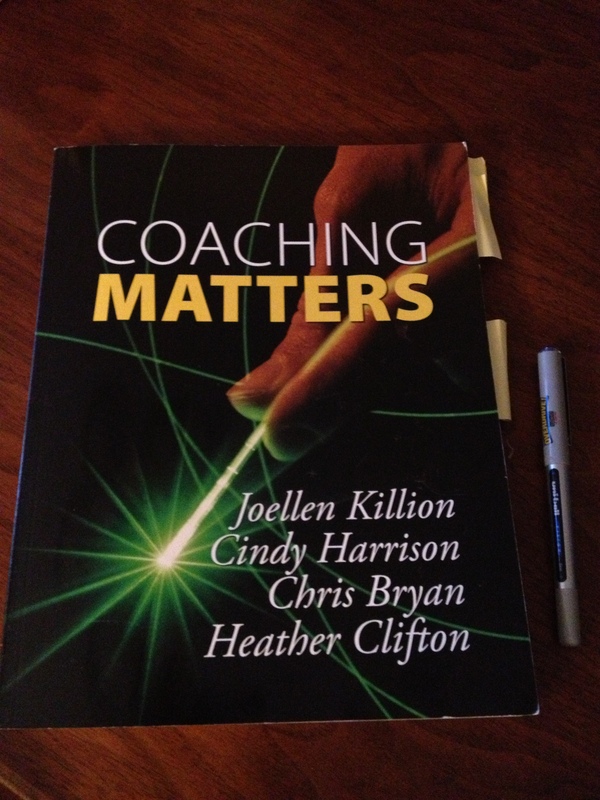 The book is Coaching Matters*, a text on PK-12 teacher leadership, and is described by its authors as addressing “…whether coaching matters. In other words, does it work?” My point here is not to offer a book review, but rather to revel in the fact that a book written for educational pracitioners is framed by evaluative thinking! While this is likely not new learning for an evaluator, isn’t it wonderful to see basic tenets of evaluation outlined in a text for education professionals? I consider it a modicum of proof positive that evaluation is indeed, as Michael Scriven describes, the alpha discipline. *by Joellen Killion, Cindy Harrison, Chris Bryan, and Heather Clifton; published by Learning Forward, 2012. Thanks for your comment Mya! It’s a great book for teacher leaders (coaches) and the principals who work with them (and, of course, for a program evaluator tasked with evaluating a coaching program!). What a pleasant surprise! I was also pleasantly surprised to find a few chapters on evaluation in a book about nonprofit leadership and management. The book is called “Managing to Change the World” by Allison Green and Jerry Hauser. It’s an interesting book because they talk about setting goals and then creating a “culture of excellence” that tracks performance towards those goals. I don’t think they ever used the word “evaluation,” even though they were describing an evaluation process and how evaluation can improve organizations. Thanks for your comment and great addition with Managing to Change the World. A pleasant surprise, indeed! More proof positive of Scriven’s prophecy.